Just a very quick and unstructured note on Greece. There is lots of confusion under the sky, and it seems to me that creditors are today advancing in sparse order. Yesterday something rather upsetting happened, as the Eurogroup suspended bailout payments because Greece engaged in some extra expenditures. These are mostly targeted to pensioneers and to the Greek islands that had to endure unexpected costs linked to the refugee crisis. Unexpectedly, the Commission is siding with Greece, with Pierre Moscovici arguing that the country is on target, and that its effort has been remarkable so far. In fact, I have understood, Greece is doing so well that it overshot the target of structural surplus for 2016, and it it these extra resources that it is engaging in order to soft the impact of austerity. And then there is the IMF, accused by Greece of pushing for more austerity, is also under attack from EU institutions (Eurogroup and Commission) for its refusal to join the bailout package. The Fund has hit back, in a somewhat irritual blog post signed by Maurice Obstfeld and Poul Thomsen (not just any two staffers) and seems not to be available to play the scapegoat for a program that in their opinion was born flawed. In fact, I think that more than to Greece, Obstfeld and Thomsen have written with the other creditors in mind. I have two considerations, one on the economics of all this, one on the politics. I think I will side with the IMF on this. At least with the recent IMF. Since the very beginning The IMF has dubbed as irrealistic the bailout package agreed after the referendum of 2015 . The effort demanded to Greece (the infamous 3.5% structural surplus to be reached by 2018) was recognized to be self-defeating, and the IMF asked for more emphasis on reform, with in exchange a more lenient and realistic approach to fiscal policy: debt relief and much lower required suprluses (1.5% of GDP). In other words, the IMF seems to have learnt from the self-defeating austerity disaster of 2010-2014, and to have finally an eye to the macroeconomic consistency of the reform package. I still believe that the bailout should have been unconditional, and require reforms once the economy had recovered (sequencing, sequencing, and sequencing again). But still, at least the IMF now has a coherent position. Moscovici’s FT piece linked above also seems to go in the same direction, arguing that nothing more can be asked to Greece. It falls short of acknowledging that the package is unrealistic, but at least it avoids blaming the country. And then there is the Eurogroup, actually, Mr Dijsselbloem and Schauble (let’s name names), that did not move an inch since 2010, and fail to see that their demands are slowly (?) choking the Greek economy, stifling any effort to soften the hardship of the adjustment. The political consideration is that the hawks still give the cards, as they dominate the eurogroup. But they are more isolated now. Evidence is piling that the eurozone crisis has been mismanaged to an extent that is impossible to hide, and that the austerity-reforms package that the Berlin View has imposed to the whole eurozone is a big part of the explanation for the political disgregation that we see across the continent. The more nuanced position of the Commission, the IMF challenge to the policies dictated by the hawks, therefore represent an opportunity. There is a clear political space for an alternative to the Berlin View and to the disastrous policies followed so far. The question is which government will be willing (and able) to rise to the occasion. I am afraid I know the anwser. The EMU policy debate in the past few months kept revolving around monetary policy. Just this morning I read a Financial Times report on the never ending struggle between hawks and doves within the ECB. I am all for continued monetary stimulus. It cannot hurt. But there is only so much monetary policy can do in a liquidity trap. I said it many times in the past (I am in very good company, by the way), and nothing so far proved me wrong. More than 17 million jobs would have been lost, about twice the actual number. The budget deficit would have grown to more than 20 percent of GDP, about double its actual peak of 10 percent, topping off at $2.8 trillion in fiscal 2011. Today’s economy might be far weaker than it is — with real GDP in the second quarter of 2015 about $800 billion lower than its actual level, 3.6 million fewer jobs, and unemployment at a still-dizzying 7.6%. We estimate that, due to the fiscal and financial responses of policymakers (the latter of which includes the Federal Reserve), real GDP was 16.3% higher in 2011 than it would have been. Unemployment was almost seven percentage points lower that year than it would have been, with about 10 million more jobs. The conclusion I draw is unequivocal: Blinder and Zandi give yet another proof that what made the current recession different from the tragedy of the 1930s it the swift and bold policy reaction. This of course nothing new. But unfortunately, it sounds completely heretic in European policy circles. In my latest post (internet ages ago) I noticed that how little Mario Draghi’s position on fiscal matters differed from Angela Merkel’s, and in general from the European pre-crisis consensus. I already showed this figure in the past. On the x-axis you have the output gap, i.e. a measure of how deep in a recession the economy is. 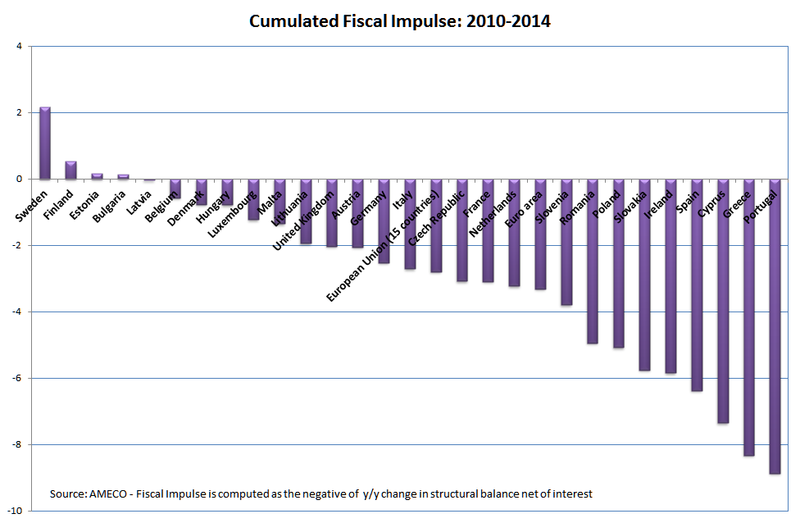 On the y-axis you have he fiscal impulse, i.e. a measure of discretionary fiscal policy (net of interest payment and of cyclical adjustment of government deficit). A well functioning fiscal policy would result in a negative correlation: If the economy goes down (negative output gap), fiscal policy is expansionary (positive fiscal impulse). This is what actually happened in 2008-2009 (red series). But then as we know European policy makers succumbed to the fairy tale of expansionary fiscal consolidations, and fiscal policy turned pro-cyclical (yellow series). A persisting output gap was met with fiscal consolidation (improvement in structural fiscal balance). Overall, policy was neutral. This is consistent with the Berlin View, that fears discretionary policies as if they were the plague. And explains much of our dismal performance. The fact that we are close to Blinder and Zandi’s “no-policy” scenario is no coincidence at all. Our policy makers should look at their blue line for the US, and realize that we could be around there too, if only they were less stubbornly ideological. Fiscal policies should support the economic recovery, while remaining in compliance with the EU’s fiscal rules. Full and consistent implementation of the Stability and Growth Pact is crucial for confidence in our fiscal framework. At the same time, all countries should strive for a growth-friendly composition of fiscal policies. Question: If I could ask you to develop the last point that you made. Governor Nowotny last week said that monetary policy may be coming up to its limits and perhaps it was up to fiscal policy to loosen a little bit to provide a bit of accommodation. Could you share your thoughts on this and perhaps even touch on the Italian budget? Draghi: On the first issue, I’m really commenting only on monetary policy, and as we said in the last part of the introductory statement, monetary policy shouldn’t be the only game in town, but this can be viewed in a variety of ways, one of which is the way in which our colleague actually explored in examining the situation, but there are other ways. Like, for example, as we’ve said several times, the structural reforms are essential. Monetary policy is focused on maintaining price stability over the medium term, and its accommodative monetary stance supports economic activity. However, in order to reap the full benefits of our monetary policy measures, other policy areas must contribute decisively. So here we stress the high structural unemployment and the low potential output growth in the euro area as the main situations which we have to address. The ongoing cyclical recovery should be supported by effective structural policies. But there may be other points of view on this. The point is that monetary policy can support and is actually supporting a cyclical economic recovery. We have to address also the structural components of this recovery, so that we can actually move from a cyclical recovery to a structural recovery. Let’s not forget that even before the financial crisis, unemployment has been traditionally very high in the euro area and many of the structural weaknesses have been there before. Carefully avoiding to mention fiscal policy, when answering a question on fiscal policy, speaks for itself. In fact, saying that “Fiscal policies should support the economic recovery, while remaining in compliance with the EU’s fiscal rules” and putting forward for the n-th time the confidence fairy, amounts to a substantial approval of the policies followed by EMU countries so far. We should stop fooling ourselves: Within the existing rules there is no margin for a meaningful fiscal expansion of the kind invoked by Governor Nowotny. If we look at headline deficit, forecast to be at 2% in 2015, the Maastricht limits leave room for a global fiscal expansion of 1% of GDP, decent but not a game changer (without mentioning the fiscal space of individual countries, very unevenly distributed). And if we look at the main indicator of fiscal effort put forward by the fiscal compact, the cyclical adjusted deficit, the eurozone as a whole should keep its fiscal consolidation effort going, to bring the deficit down from its current level of 0.9% of GDP to the target of 0.5%. It is no surprise then that the new Italian budget (on which Mario Draghi carefully avoided to comment) is hailed (or decried) as expansionary simply because it slows a little (and just a little) the pace of fiscal consolidation. Within the rules forcefully defended by Draghi, this is the best countries can do. As a side note, I blame the Italian (and the French) government for deciding to play within the existing framework. Bargaining a decimal of deficit here and there will not lift our economies out of their disappointing growth; and more importantly, on a longer term perspective, it will not help advance the debate on the appropriate governance of the eurozone. In spite of widespread recognition that aggregate demand is too low, Mario Draghi did not move an inch from his previous beliefs: the key for growth is structural reforms, and structural reforms alone. He keeps embracing the Berlin View. The only substantial difference between Draghi and ECB hawks is his belief that, in the current cyclical position, structural reforms should be eased by accommodating monetary policy. This is the only rationale for QE. Is this enough to define him a dove? While in the late 1980s the consensus among economists and policy makers was that the EMU was not an optimal currency area (De Grauwe, 2006), the choice was made to proceed with the single currency for two essentially opposed reasons: The first, stemming from the Berlin-Brussels Consensus, saw monetary integration, together with the establishment of institutions limiting fiscal and monetary policy activism, as an incentive for pursuing structural reforms and converging towards market efficiency: as the role of macroeconomic management was believed to be limited, giving up monetary policy would impose negligible costs to countries while forcing them, through competition, to remove growth-stifling obstacles to markets. Another group of academics and policy makers, while not necessarily subscribing to the Consensus, highlighted the political economy of the single currency: Adopting the euro in a non-optimal currency area would have created the incentives for completing it with a political union: a federation, endowed with a common fiscal policy and capable of implementing the fiscal transfers that are required to avoid divergence. In other words a non-optimal euro was seen as just an intermediate step towards a real United States of Europe. A key argument of the proponents of a federal Europe was, and still is, that fiscal transfers seem unavoidable to ensure economic convergence. A seminal paper by Sala-i-Martin and Sachs (1991) shows that even in the United States, where market flexibility is substantially larger than in the EMU, transfers from booming states to states in crisis account for almost 50% of the reaction to asymmetric shocks. It is interesting to notice how the hopes of both views were dashed by subsequent events. As the theory of optimal currency areas correctly predicted, the inception of the euro without sufficiently strong correction mechanisms, triggered a divergence between a core, characterized by excess savings and export-led growth, and a periphery that sustained the Eurozone growth through debt-driven (public and private) consumption and investment. Even before the crisis the federal project failed to make it into the political agenda. The euro came to be seen by the political elites not, as the federalists hoped, as an intermediate step towards closer integration, but rather as the endpoint of the process initiated by Jean Monnet and Robert Schuman in 1950. The crisis further deepened economic divergence and recrimination, highlighting national self-interest as the driving force of policy makers, and making solidarity an empty word. As we write, the Greek crisis management, the refugee emergency, the centrifugal forces shaking Europe, are seen as a potential threat to the Union, rather than a push for further integration as it happened in the past (Rachman, 2015). The Consensus partisans won the policy debate. The EMU institutions, banning discretionary policy, reflect their intellectual framework; and the policies followed (more or less willingly) by EMU countries, especially since the crisis, are the logical consequences of the consensus: austerity and structural reforms aimed at increasing competitiveness and reducing the weight of the State in the economy. But while they can rejoice of their victory, Consensus proponents have to deal with the failure of their policies: five years of Berlin View therapy has nearly killed the patient. Peripheral countries’ debt is still unsustainable, growth is nowhere to be seen (including in successful Germany), and social hardship is reaching unbearable levels (Kentikelenis et al., 2014). Coupling austerity with reforms proved to be self-defeating, as the short term recessionary impact on the economy was much larger than expected (Blanchard and Leigh, 2013), and as a consequence the long run benefits failed to materialize (Eggertsson et al., 2014). It is then no surprise that in spite of austerity and reforms, divergence between the core and the periphery of the Eurozone is even larger today than it was in 2007. The dire state of the Eurozone economy is in some sense the revenge of optimal currency areas theory, with a twist. It appears evident today, but it was clear two decades ago, that market flexibility alone would never suffice to ensure convergence (rather the opposite), so that the Consensus faces a potentially fatal challenge. On the other hand, the federalist project, that was already faltering, seems to have received a fatal blow from the crisis. The conclusion I draw from these somewhat trivial considerations is that the EMU is walking a fine line. If the federalist project is dead, and if Consensus policies are killing the EMU, what have we left, besides a dissolution of the euro? Putting in place any possible surrogate of fiscal transfers, like for example a EU wide unemployment benefit, making sure that it is designed to be politically feasible (i.e. no country is net contributor on average), eurobonds, etc. Scrapping the Consensus together with its foundation, the efficient market hypothesis, and head towards real, flexible coordination of (imperfect) macroeconomic policies in order to deal with (imperfect) markets. Government by the rules only works in the ideal neoclassical world. I know, more easily said than done. But I see no other possibility. So, Mario Draghi is disappointed by eurozone growth, and is ready to step up the ECB quantitative easing program. The monetary expansion apparently is not working out as planned. A liquidity trap is a situation, described in Keynesian economics, in which injections of cash into the private banking system by a central bank fail to decrease interest rates and hence make monetary policy ineffective. A liquidity trap is caused when people hoard cash because they expect an adverse event such as deflation, insufficient aggregate demand, or war. So, had policy makers taken the time to look at the history of the great depression, or at least to open the Wikipedia entry, they should have learnt that when monetary policy loses traction, the witness in lifting the economy out of the recession, needs to be taken by fiscal policy. In a liquidity trap the winner is fiscal policy. Or at least it should be. Here is a measure of the fiscal stance, computed as the change in government balance once we exclude cyclical components and interest payments. And yet, Mario Draghi is surprised by the impact of QE. First, the claim that Tsipras’ rhetoric on democracy is misplaced: After all, people say, we all are democracies. Why should Greek democracy count more than the Portuguese, or the Spanish one? There is no reason, of course. Point is that Tsipras did something that is now really revolutionary in Europe, he tried – hold your breath – to implement the platform on which he was elected. How many governments in Europe went to power promising an end to austerity, promising a “new deal for Europe”, just to retract a few months/weeks/days later and align themselves with the Berlin View that austerity is the only way? Greek democracy today should count more than democracy in the rest of Europe, because it is the only case in which voters are actually listened to by their government. This is why Syriza’s anomaly needed to be crushed, well beyond the actual content of its proposed policies. If European policy makers feel that their democracy should be as important as Greece’s, they could start by trying to do what their voters elected them for. That would certainly not hurt. The second thing that bothers me, is the convergence of the establishment and of euro-skeptical movements across Europe. Don’t be fooled by the enthusiastic adherence of many no-euro movements to the Oki campaign Their siding with Tsipras was instrumental to Grexit, turmoil, and weakening the euro itself. Something orthogonal to what Tsipras has been doing and saying in the past two years. The referendum made it clear that the establishment and the no-euro converge in trying to prove that there is no alternative to austerity in Europe. The former, because if Greece is not normalized, we would enter into a new phase in which statements and policies would have to be assessed on the basis of facts (not so favorable to austerity) rather than taken as a matter of faith. Euro skeptics need Tsipras to be crushed because this would definitely prove that the only way to get rid of austerity is to get rid of the euro altogether. Therefore the referendum, while certainly hazardous and ill-conceived (what did the Greek people vote on, in the end? ), had the great merit of exposing the hypocrisy of some commentators, and to show that the only hope for a different Europe has to be found in the struggle that an inexperienced prime minister is leading from Athens. Since yesterday, with the renewed support of his people. Dangerous times ahead, but with a small hope for change. Very busy period. Plus, it is kind of tiresome to comment daily ups and downs of the negotiation between Greece and the Troika Institutions. But as yesterday we made another step towards Grexit, it struck me how close the two sides are on the most controversial issue, primary surplus. Greece conceded to the creditors’ demand of a 1% surplus in 2015, and there still is a difference on the target for 2016, of about 0.5% (around 900 millions). Just look at how often most countries, not just Greece, respected their targets in the past, and you’ll understand how this does not look like a difference impossible to bridge. I took total social expenditure that bundles together pensions, expenditure for supporting families, labour market policies, and so on and so forth. All these expenditure that, according to the Berlin View, choke the animal spirits of the economy, and kill productivity. Well, Greece does not do much worse than its fellow crisis economies, but it is true that it is hard to detect a downward trend. The reform effort was not very strong, and certaiinly not adapted to an economy undergoing such a terrible crisis. 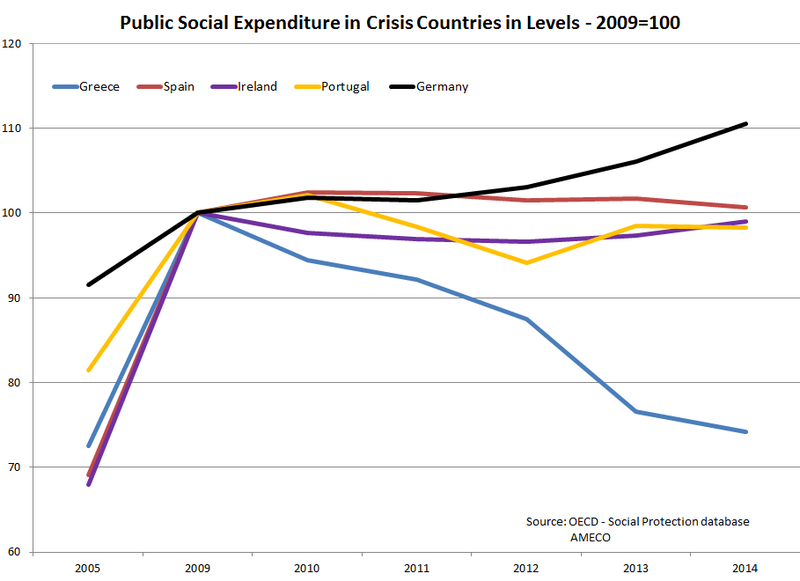 The very fact that after four years of adjustment program the country spends 24% of its GDP in social protection, is a proof that it cannot be trusted.This is just proof that, once more, the Greek made fun of their fellow Europeans, and that they want us to pay for their pensions. The picture looks quite different, does it? Greece, whose crisis was significantly worse than for the other countries, slashed social expenditure by 25% in 5 years (I know, I know, it is current expenditure. I am too busy to deflate the figure. But I challenge you to prove that things would be substantially different). Now, just in case you had not noticed, social expenditure has an important role as an automatic stabilizer: It supports incomes, thus making hardship more bearable, and lying the foundations for the recovery. In a crisis the line should go up, not down. This picture is yet another illustration of the Greek tragedy, and of the stupidity of the policies that the Troika insists on imposing. By the way, notice how expenditure increased from 2005 to 2009, in response to the global financial crisis. A further proof that sensible policies were implemented in the early phase of the crisis, and that we went berserk only in the second phase. One may object that focusing on expenditure is misleading. 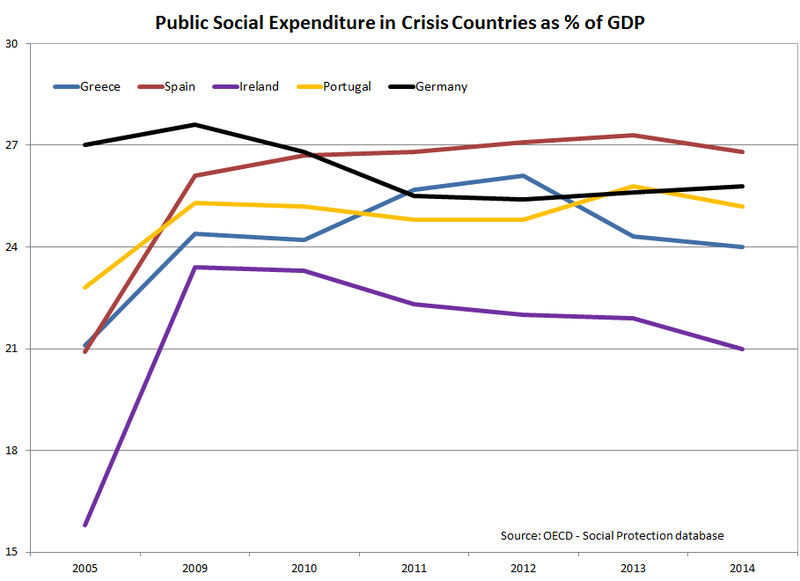 There is more than expenditure in assessing the burden of the welfare state on the economy. While Greece slashed spending, its welfare state did not become any better; its capacity to collect taxes did not improve, that its inefficient public administration and its crony capitalism are stronger than ever. Yes, somebody may object all that. That someone is Yanis Varoufakis, who is demanding precisely this: stop asking that Greece slashes spending, and lift the financial constraint that prevents any meaningful medium term reform effort. Reform is not just cutting expenditure. Reform is reorganization of the administrative machine, elimination of wasteful programs, redesigning of incentives. All that is a billion times harder to do for a government that spends all its energies finding money to pay its debt. Real reform is a medium term objective that needs time, and sometimes resources. In a sentence, reform should stop being associated with austerity.